Today's most dangerous forms of messaging abuse are no longer the broad, indiscriminate attacks of the past, flooding ISPs with spoofed email in hopes that some would catch subscribers unaware. Rather, today's most dangerous attacks are aimed at particular organizations or people, and they employ highly sophisticated strategies combining identity theft, spoofing and malware. Ultimately, these cybercrimes erode the necessary foundation of trust between enterprises, ESPs and customers. Often overlooked, message streams are frequently the original source of these attacks, and if they are compromised, criminals can proceed despite the most robust network security provisions. 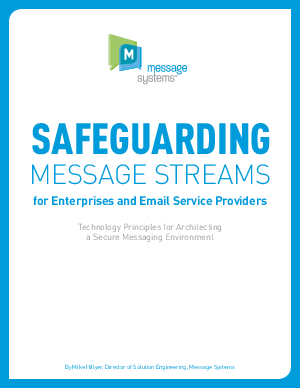 In this whitepaper, Mike Hillyer, Director of Solution Engineering at Message Systems, presents seven principles for architecting a safe messaging environment. The authors then describe how to put these principles into action to protect both inbound and outbound messaging streams.